I have adapted this idea to fit the type of container I had on hand. I would love to say I thought of it myself, but I must give credit to my friend who has the original, full trash can size. 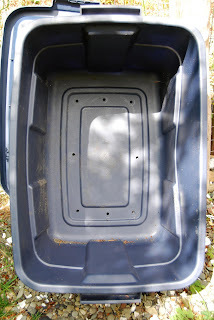 I decided to use these handy totes that have been with me for years working very hard at storing or moving all my junk. I have two sizes. 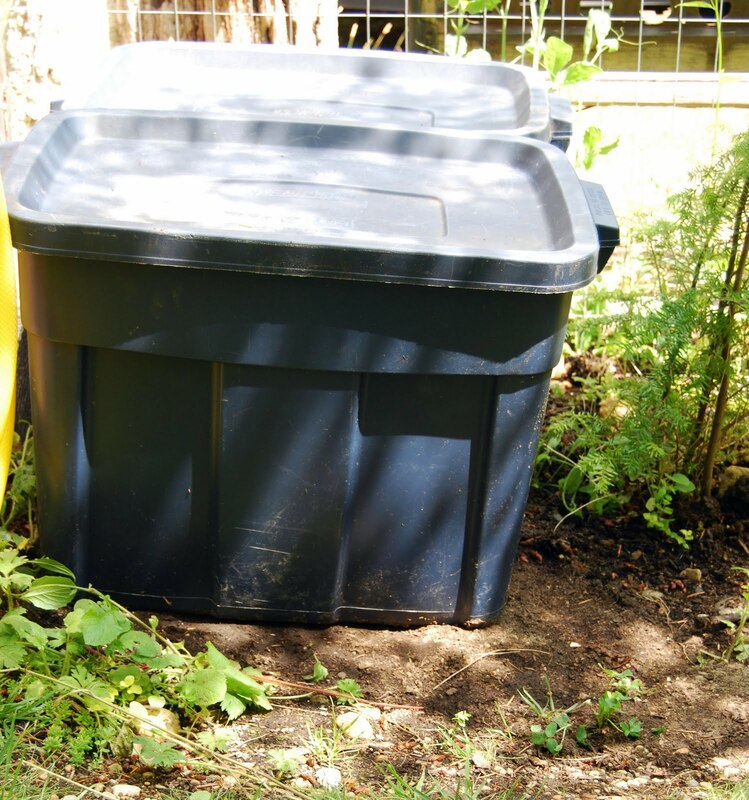 The large ones are perfect for the longer term compost, where the smaller one works great for compost immediately from the kitchen. I drilled half inch size holes in the bottom so the worms would feel welcome. These dark containers are great for heating things up too, while sitting in the sun. As I add material to it, I also add a layer of dirt. I've had the new compost bins in use for a couple of weeks now and have already gone out and turned one in to another, finding the material is breaking down quickly! I have positioned the two large ones on top of an already rich soil base (so the worms won't have to go far). While it's not exactly attractive, it really serves the purpose well and I haven't spent a dime! The lids on these are perfect because they cover the top and remain water resistant. 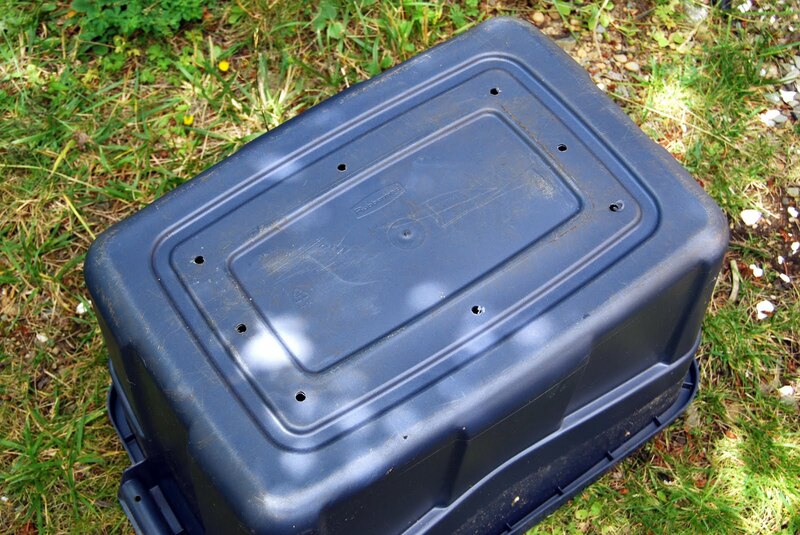 I am also using these types of containers with holes for grass clipping and mulch material. I leave the lids off and the water drains out. What types of containers have you used for composting? excellent idea! I have two large ones but the wrong lids! LOL Still, I think it would work. Great idea!! Yes, Mira, I think even the wrong lids will work. If you drill holes in the bottom, they will drain anyway. I had an after thought to paint the bins something cute too! I love the part about drilling the holes so the worms feel welcome! :-) These compost bins are not unattractive. In fact, I like the way they stack and have lids for getting into them easily. They look tidy and organized. Neat project and result! Thank you for stopping by Jennifer! I have since come to realize that they also work for grass clippings for mulch, and other materials! You are right, the stacking ability is a plus too!